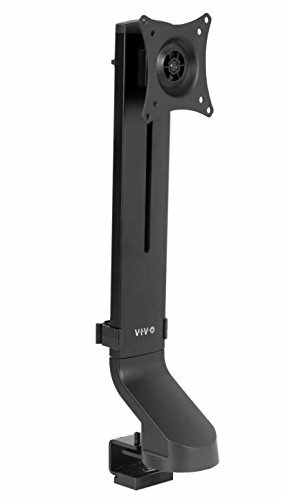 Find the perfect addition to your standing desk workstation with single monitor mount (STAND-V001U) from VIVO! Constructed of high-grade steel, this stand was built to resist scratches and support a 17" to 32" monitor screen weighing up to 17.6 pounds. The sleek, black appearance blends well with virtually any environment. Featuring simple height adjustment and articulation for comfortable viewing angles, desk mounting options for excellent support, and integrated cable management to keep cords clean and organized, this stand will add a whole new dimension to your workstation. All hardware and instructions are provided to get your stand installed and screen mounted in no time! • Supports one monitor screen 17" to 32"
• The clamp is designed for sit-to-stand workstations and thinner desks. Please measure your desk's thickness before purchasing to ensure compatibility. • Height Adjustment Range: 7.5"
• Recommended Desktop Thickness: 3/8" to 3/4"
FULLY ADJUSTABLE - Find the viewing angle that's right for you with an arm offering -10° to +10° tilt, 20° swivel, and 360° rotation. Also, enjoy 7.5" of smooth height adjustment along the center pole. COMPATIBILITY - This stand fits one computer monitor 17" to 32" with VESA 75x75mm and 100x100mm mounting holes. Recommended desk thickness is 3/8" to 3/4", and both grommet and desk clamp mounting options are included. CABLE MANAGEMENT - A detachable clip is provided on the stand to keep power and AV cords neatly out of the way for a clean and organized appearance.